God bless The Taverners. When multiple eyes are always checking in the nooks and crannies, you never know what they may find. This limited-edition DCC RPG Starter Box is only available while supplies last! It includes a special edition of the DCC RPG core book, printed with gilded edges, thumb tabs, and a dust jacket. In addition, the boxed set contains 7 adventure modules, plus stickers, a character record folio, character sheets, and more. 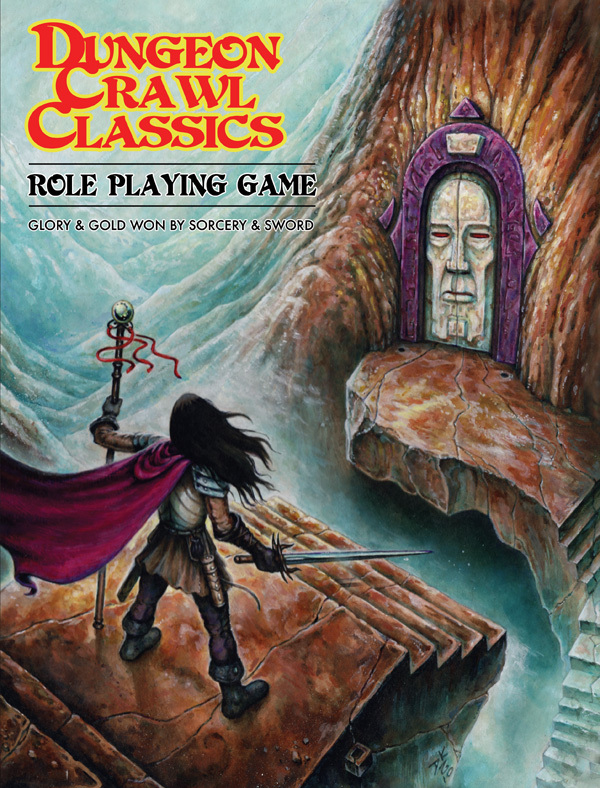 All is packaged in a sturdy corrugated cardboard box custom-printed with the DCC RPG logo. This is a complete "campaign in a box,"
Suggested retail is $100. Preorder through above is $70. I find nothing about it on the Goodman Games site. Yeah this sounds like exactly what I got with the 4e Kickstarter. What are the adventures included? That is absolutely the DCC RPG 4th printing kickstarter rewards box. The closest thing we ever sold in stores were the treasure chests, were are long since out of stock. Do you recall what modules are included in this? Is this already sold out? Appears to be. Glad I didn’t order it now that I know it’s the stuff I got from the 4th printer KS. I think an actual Starter Box would be REALLY cool - include dice, a couple of saddle-stapled rulebooks (and maybe an extra spells book) and enough info to go from L1-L3 in the core classes. You know, Red Box, but with DCC Goodness inside. INCLUDE DICE. Throw in a good sandboxy module in the spirit of B1 or B2 turned up to 11. Did I mention dice? That's one of the biggest stumbling blocks to getting new players in to DCC. Seriously. We have some DCC love in our club, and a true, puspose-written starter box would be pretty darn awesome.